Fridays as “fend nights” are not what they used to be. It used to be that on a “fend night,” I’d come home and help everybody figure out which leftovers they wanted. We’d heat things up, dish a little of this and that onto plates, and be done with it. Gradually, that model has started to shift; and over time, we’ve gone from the no-cook model I intended…to the “low-cook” model of having to tweak those leftovers a bit (usually by making quesadillas or something like that)…to the current “creative subsistence” model, which involves me thinking carefully about what I can cook from the items left in the house to make a complete meal for my family. What can I say? These three guys I live with are eating me out of house and home. 🙂 Food just doesn’t seem to stretch as far as it used to; but then again, we’re also wasting less food, which is GREAT, and we’re probably buying less as well, if I’m truthful. The stuff we’re eating is higher in quality than it was even a year ago, and it feels more abundant somehow, but we are no longer a household in which there’s an embarrassment of riches in terms of food choice. So when Friday rolls around, and the cupboards are essentially bare (seriously, there are whole empty shelves in our refrigerator right now), I have to make a little magic to get a good dinner on the table without resorting to take-out. Today was sort of a rocky day across the board. Last night, right before bedtime, P. spontaneously walked into the bathroom and said, “I gonna go potty.” Yes, my non-trained 2-year-old took matters into his own hands and decided it was high time to ditch the diapers. He had a couple of quite successful potty adventures last evening, which sparked a harried trip out for toddler-sized race car underpants after he fell asleep. (If anyone wondered why I didn’t post yesterday…this is why. I was in line at the store, debating between “Cars” and “Diego.”) Unfortunately, our little champ didn’t continue his big boy ways today, and decided to spend his first full morning as a potty-trainer pitching an epic tantrum at day care, having multiple accidents, and generally fraying my nerves before J. and I even made it to work this morning. Towards the end of the day, I realized that I hadn’t given much thought to the question of our now erroneously named “fend” night. A quick mental checklist proved that, yes, the food supply was pretty sparse…but there was nitrate-free uncured bacon; some flour; and, as always, frozen organic fruit. Breakfast for dinner to the rescue. It’s serendipitous, too, because somehow something like waffles always seems more appropriate on a Friday night than, say, a Tuesday. 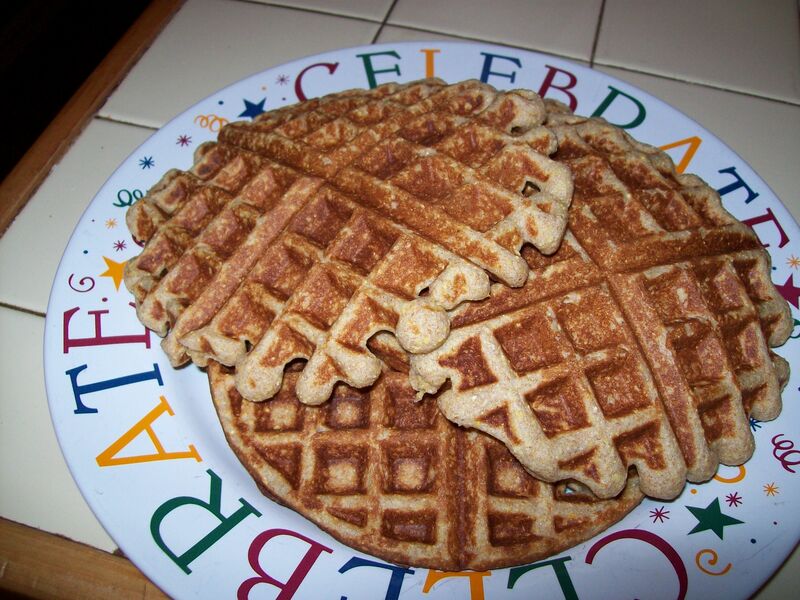 I did want to do something different with our usual whole-wheat waffle batter, though; something more interesting, something a little more special. Since lately the kids have apparently been in love with corn muffins, I thought it might be nice to make corn muffin waffles. J. said he was game for the experiment, but seemed a bit skeptical. The kids, predictably, reacted with enthusiasm to bacon, smoothies, and something called muffin waffles for dinner. As it happens, the kids were right to be excited. The texture of the cornmeal in the whole-wheat waffles was a welcome change from the ordinary, and the slightly sweet, slightly nutty flavor was perfect with a side of crispy bacon. P. ate so much I actually feared he’d be sick. As for J., L., and myself…there were definitely no complaints. It’s amazing how right the world can seem after a good family dinner, no matter how humble. L. was all smiles and chatter this evening, and P. went a few hours completely accident-free, with three successful visits to his new favorite room in the house. I suddenly felt my shoulders drop about a mile as I played balloon volley with L. and read stories to P. What started as a relatively stressful day — and, I might add, didn’t improve drastically for any single member of our family — turned rapidly with a plate of corn muffin waffles, and became a fun, even semi-relaxing, Friday evening. Oh, I know, it was probably just the ritual of family dinner itself that did it for us. It probably wasn’t really the waffles. But you know, I don’t think they hurt anything. 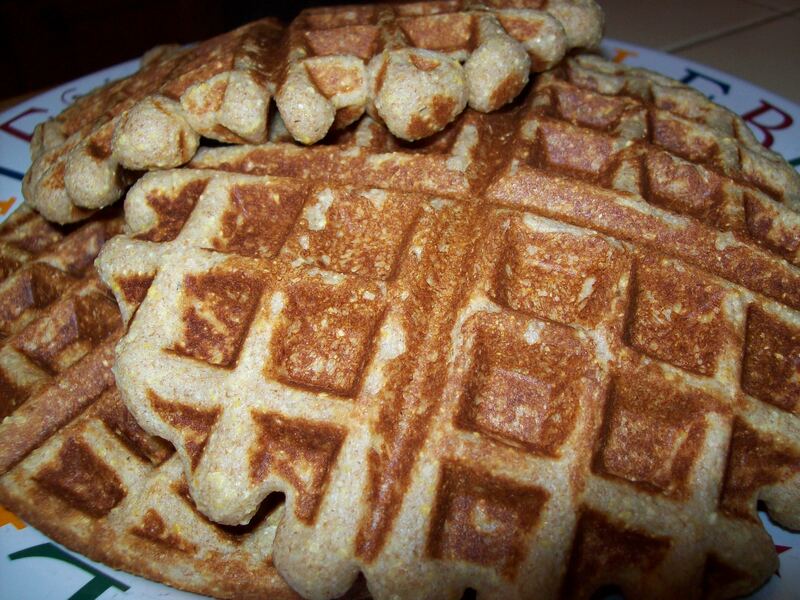 As a matter of fact, I dare you to even SAY “corn muffin waffles” without smiling. Go ahead, give it a try. Then make them, and see if the magic works on your family, too. This entry was posted in Cooking, Feeding kids, Food culture, Meal planning, Parenting and tagged baking, cooking, family, feeding kids, food, Food Revolution Fridays, Household organization, Jamie Oliver, kids' health, meal planning, milestones, muffins, parenting, recipes. Bookmark the permalink. I’ve gotten so good at cooking for two (something I wasn’t so great at before) that I’m finding that Fend Night wouldn’t really work for us. My weeknight meals average about 3-ish servings (especially with a pregnant wife who claims she’s “eating for two”), which amounts to one for her, one for me, and maybe one for one of us for lunch the next day. That leaves the fridge pretty barren of leftovers come Friday and we usually do our “eat out night” on Thursday. Lately, I’ve been trying to make Friday homemade pizza night. It’s easy, dead-cheap, and it lets us also have a “mostly meat free night.” I’ll throw some flour, yeast, water, and salt into the stand mixer as soon as I get home, let it do the heavy kneading, cover it with plastic, and let it do its thing for an hour or so. I usually have some homemade sauce kicking around (canned, even, when I’ve been productive) and I’ve been trying to keep melting cheese on-hand. Toppings are whatever I can rummage from the fridge. The nice part is that my dough recipe is enough for two nights, so I freeze it and if I can remember to thaw it, I don’t have to make dough next week (and if I forget to thaw it, I end-up with balls and balls of dough in the freezer). So far, this has worked out well for us. I’m quite happy with it and I’m hoping that when our child gets onto solid foods that I can continue, perhaps making the dough in the morning and doing a cold rise during the work day so we don’t eat quite so late at night. Or, maybe I’ll just double the batches and freeze one-night portions and get better at remembering to thaw. We love homemade pizza night, and if it weren’t in the rotation so often, not to mention a fall-back lunchbox staple around here, I’d certainly be doing that on a lot of Fridays myself! 🙂 The pizza dough recipe I make is designed to rise overnight in the fridge, so that’s a good one to do when you’re busy with a young family. It just needs to come to room temp for about 15 minutes before you can really play with it. It does freeze well, though, too, and thaws in only an hour or so. Perfect when you’re in a pinch! That’s a pretty neat idea! You can probably use it as-is for pancakes. I’m not sure how thin the batter is, so I’d reserve some milk towards the end to prevent it from becoming too runny. That’s you’re only real concern with pancakes over waffles. You want it to form pancakes that aren’t too thick or so thin that the batter runs all over the griddle.